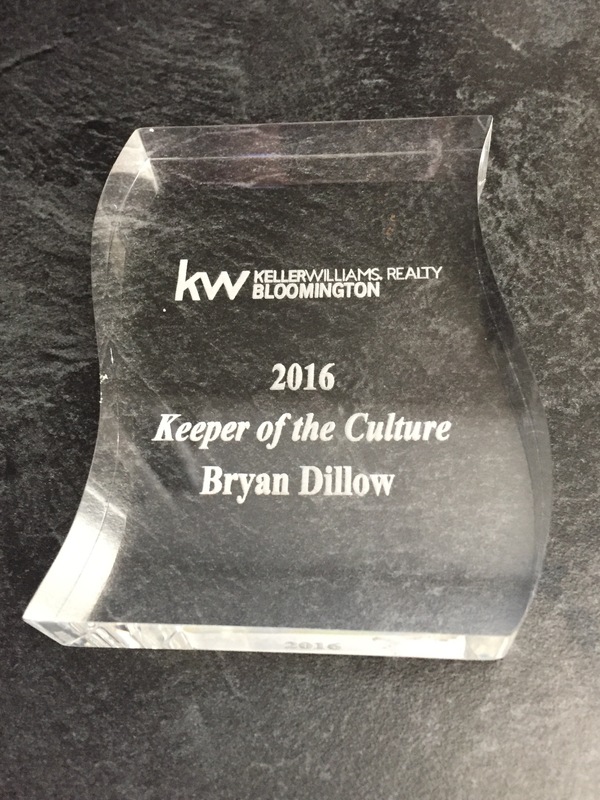 Our very own Bryan Dillow was awarded the Keller Williams of Bloomington, IL “2016 Keeper of the Culture” award this morning at our Keller Williams Realty of Bloomington, IL Awards Ceremony which took place at a local staple, the Normal Theater. The “Keeper of the Culture” is an acknowledgment awarded to the single person who presents the sharing culture and willingness to help. “He’s awesome like that”, says KW Bloomington Team Leader, Noreen Behrends. Noreen explains just why Bryan won this award by sharing multiple occasions when Bryan would set aside time to meet with ‘newbies’ of Keller Williams to help them with various challenges such as navigating websites, listing clients homes for sale, and tips on growing their business. Way to go, Bryan! We are proud to have Bryan as our Lead Agent on the BN Realty Team here at Keller Williams of Bloomington. Call Bryan and the BN Realty Team for all your real estate needs! We are here to help you! 309-319-6030!